Hello! It's been a busy week! Now that I no longer have the commitments of running a design team or being a PTG board member, I decided that I needed to make some time for me. 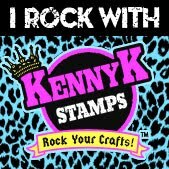 I am trying to make a conscious effort to become more active over at Kit and Clowder - taking coloring classes, participating in the monthly book club - and with my favorite stamp companies. This includes starting to enter some challenges again. 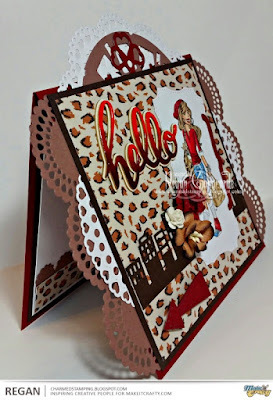 Today I am sharing a card I made for the Kraftin' Kimmie Stamps Monthly Make It Challenge over on Facebook in the Kraftin' Kimmie Stamps' Krafty Friends group. 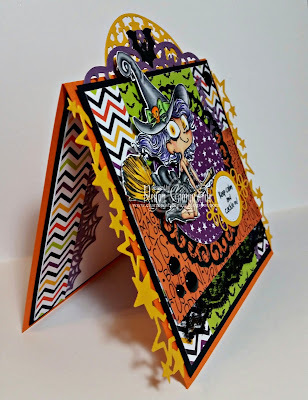 Kim challenged us to an Anything Goes theme with one stimpulation... We had to use one of the new releases from July or August. 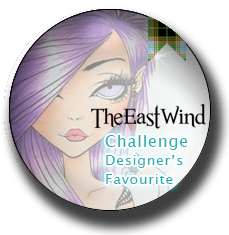 I chose to work with WitchyPoo! 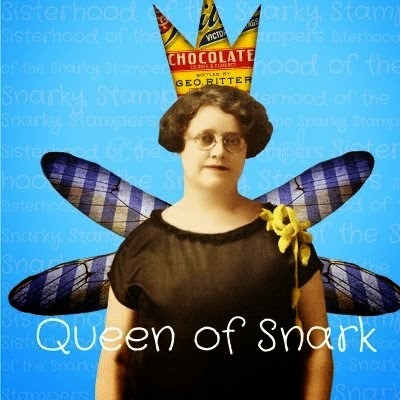 This is an image by artist Annie Rodrigue. 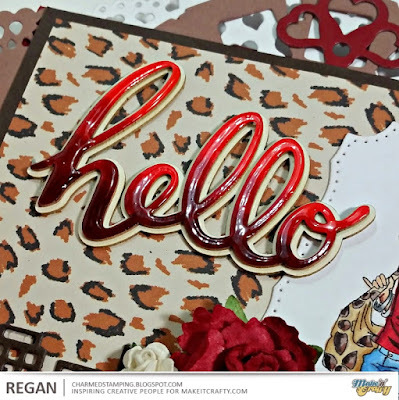 She was originally released in red rubber, but recently Annie updated her and Kim released her a clear set accompanied by some fabulous sentiments! I colored WitchyPoo with my Copics and fussy cut her. She is popped up on foam dies. I have layered on a few dies from my collection, of course. 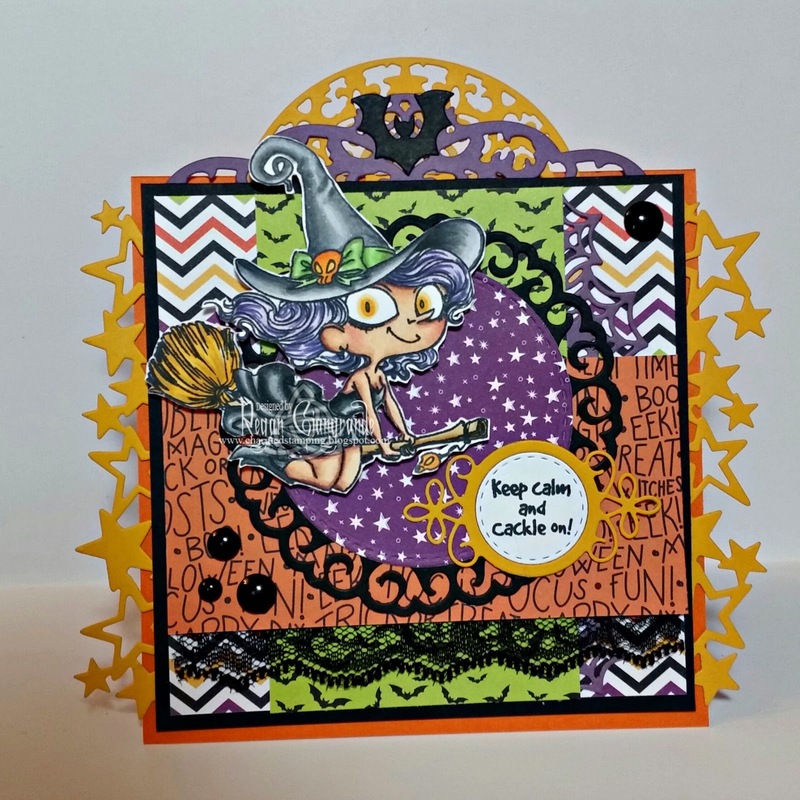 Here I've used Stars Border, Filigree Border, Filigree Moon, Bats, Koi Circle, Spider Web Border, Fancy Label, and Stitched Nested Circles all from La-La Land Crafts. For embellishments, I added a bit of lace and some black enamel dots. 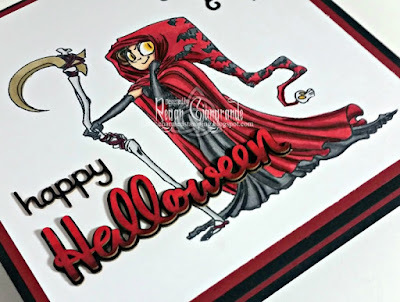 I used the September sketch for my card as well. 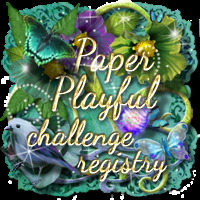 All the details about KKS weekly challenges and the month long sketch can be found on the blog HERE. Thanks for stopping by to see what I've been up to! Have a wonderful weekend! Today I am sharing a card for my favorite holiday, Halloween! 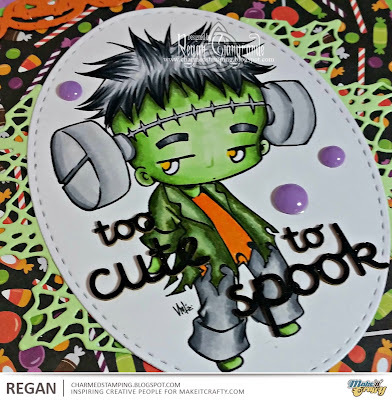 I colored up Mini Frankenstein and cut him out with the Stitched Elements oval die from La-La Land Crafts. 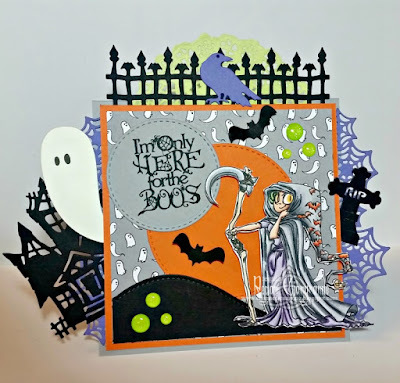 I then layered more dies (Haunted Hill Border, Pumpkins Border, Spider Web, Steampunk Border, Steampunk Heart Cogs, and Stitched Tags) and added a sentiment that I created using words in the Boo adapt-a-word chipboard set. I colored the words with my Black 100 Copic marker and topped that with a coat of Black Wink of Stella to give it some sparkle. I'm going to give this card to my son for Halloween! The purple enamel dots are from Nicole Crafts. Thank you again to Zoe and team for making me feel so welcomed! Being a guest has been an amazing experience! Be seeing you around! Be sure to visit the MIC shop and blog for lots of fabulous digis, yummy chipboard, and loads of inspiration! Hello! I can't believe that September is almost over! 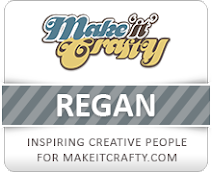 It has been so much fun being a guest designer here at Make It Crafty! I would like to thank Zoe and her team for having me and for being patient with my, ehem, punctuality issues. 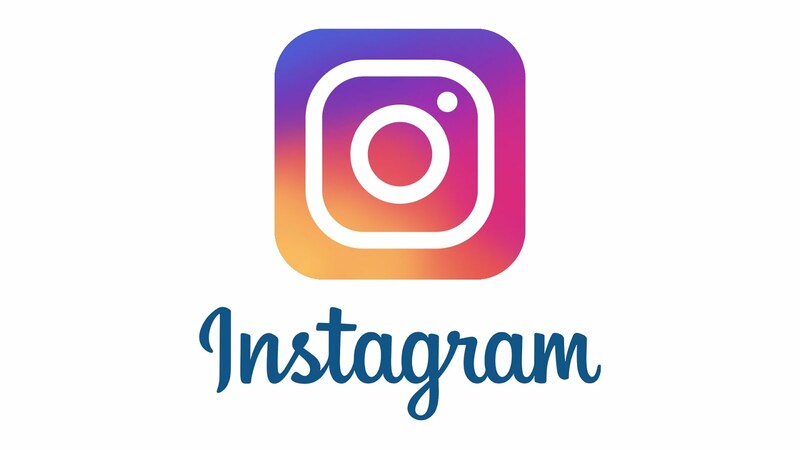 Lol I only have one more post after today and then I say farewell. Where does the time go, right? I have loved this mermaid since I first laid eyes on her and was happy to finally have a chance to color her! 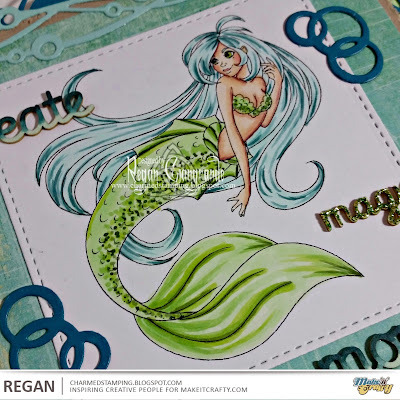 Her name is Mermaid Viviane and she is, of course, colored with Copics. 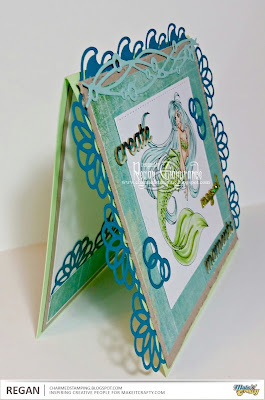 I cut her with Double Stitched Square die from La-La Land Crafts and layered that on my card along with a few other LLLC dies. 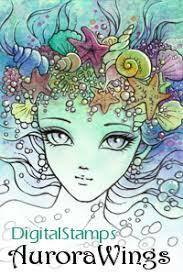 Here I've used Waves Border, Wave Flurry Border, Bubbles (from Sea Critters), and Loopy Border. 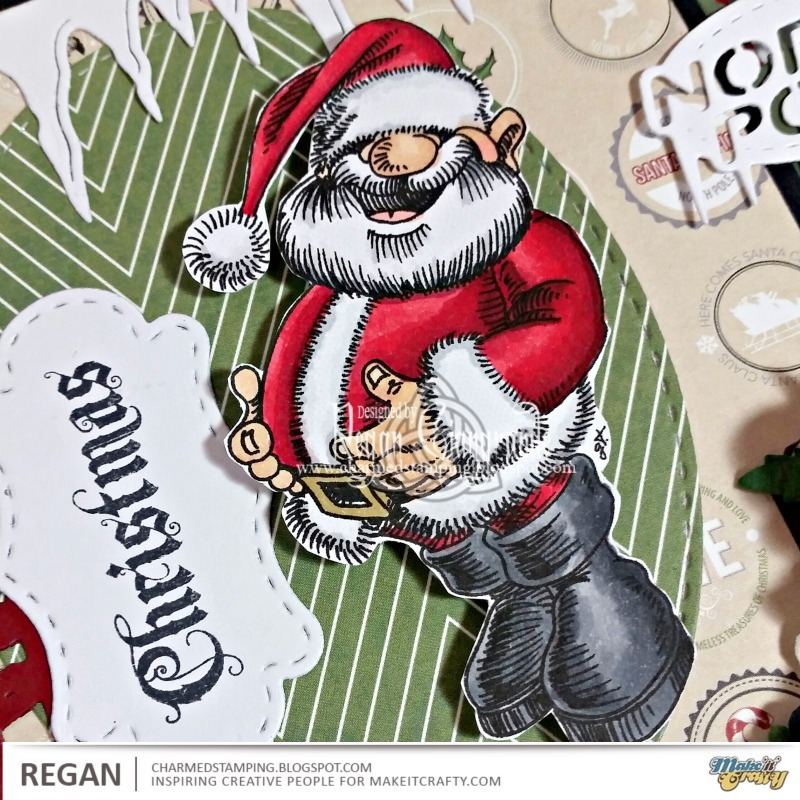 I couldn't resist using some more of the awesome chipboard words as well! 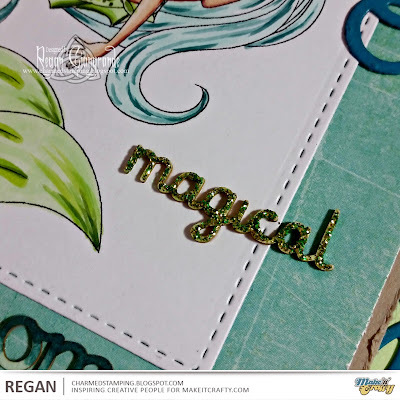 I created my sentiment using a combination of words from the Magical adapt-a-word chipboard set. I colored "create" and "moments" with my Copics to create an ombre effect. "Magical" was colored in with Copic marker as a base then covered in Stickles glitter glue in Lime Green. 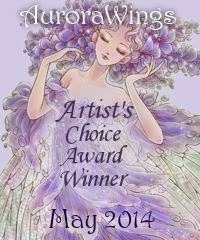 Thanks for checking out my work! 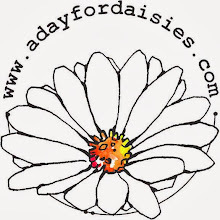 Have a fabulous day! Hey there! Welcome to Kraftin' Kimmie Stamps Halloween Release Day! Anyone who knows me knows that Halloween is my ABSOLUTE FAVORITE holiday! In fact, my decorations are already up! 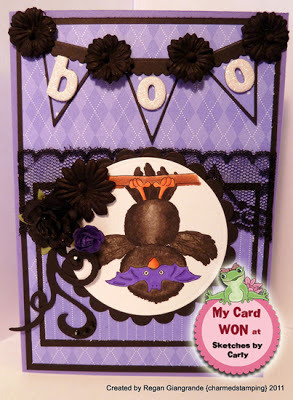 So it's no stretch that I would have started on my Halloween crafting as well! 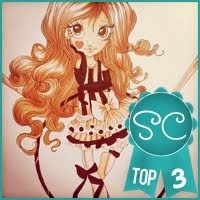 I start scoping out the craft stores in August for supplies! 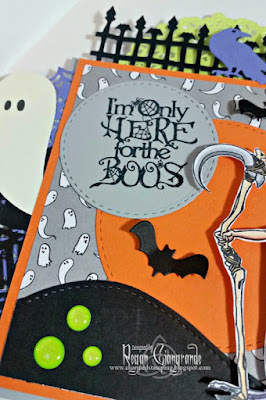 This year they were a bit slower to get things in so when I saw Kim offer a Super Secret Krafty Klub Halloween Kard Kit, I was in! Grim Gretchen by artist Annie Rodrigue arrived in my mailbox along with some other fun Halloween trinkets! 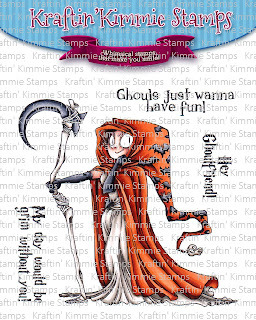 This clear stamp set features one main image and three humorous sentiments. I colored Gretchen with my Copics and fussy cut her. (This was no small feat!) 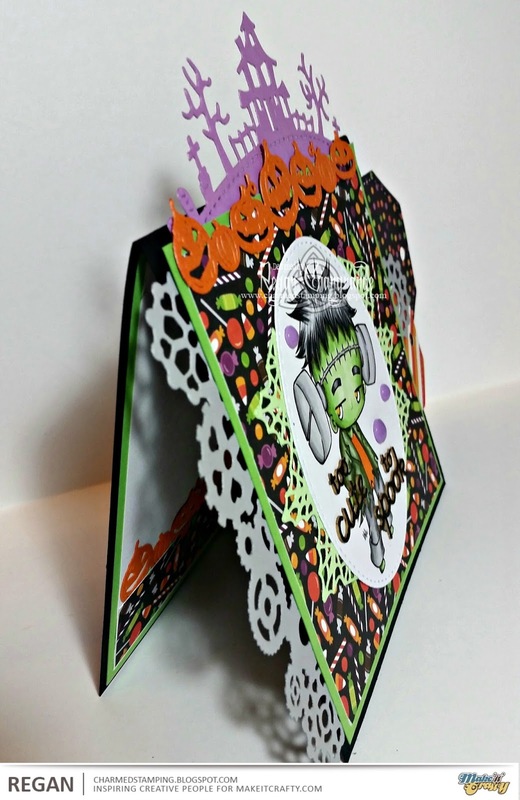 I then designed my card to incorporate some of the items that had arrived in the kit with her. 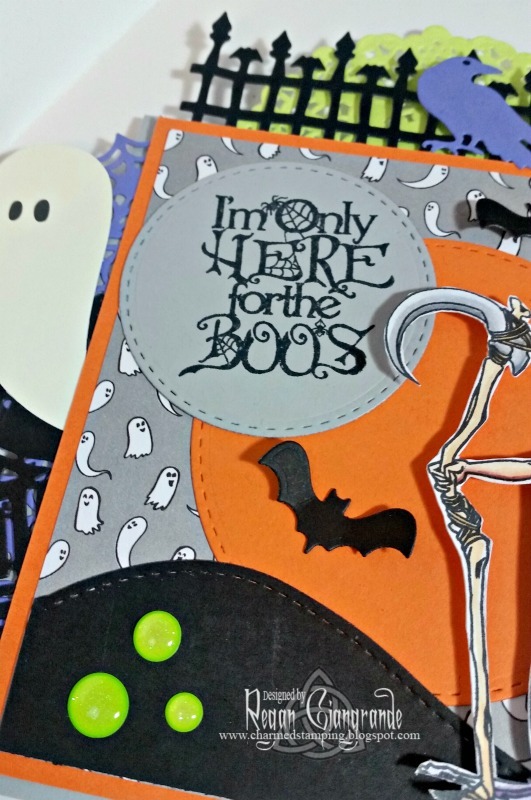 The paper, ghost, doily, bat die, and enamel dots were all included. 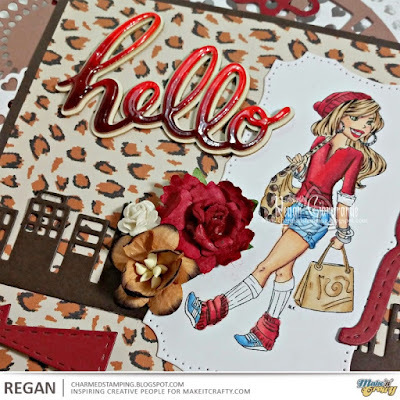 The rest of the details are from my stash of La-La Land Crafts dies! 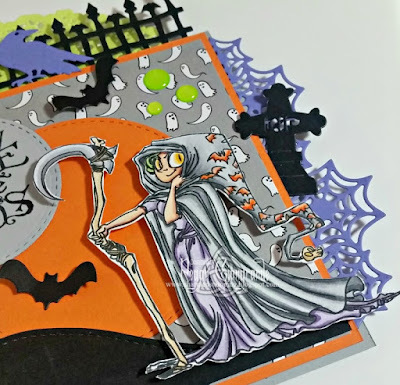 For this project I've used Spiderweb Border, Crows, Tombstones, Spooky House, Frightful Fence, Stitched Nested Circles, and Double Stitched Hills Border. The sentiment is one of those wooden rubber impulse buys from Michaels. It's RELEASE DAY!!! And in typical Kimmie style we are celebrating with a Krafty Hop! 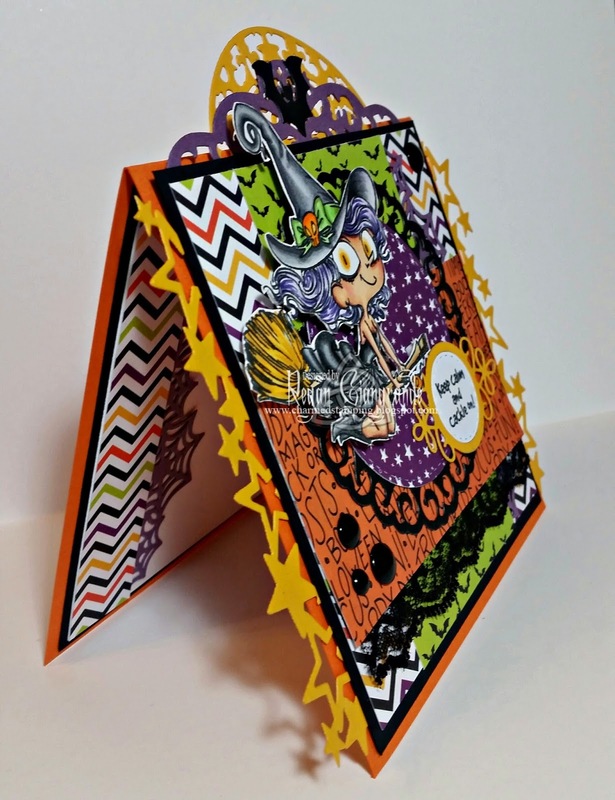 Hop around to see all the fa-boo-lous new sets being showcased then head to the Kraftin' Kimmie Stamps store for some Halloween retail therapy! Hello! 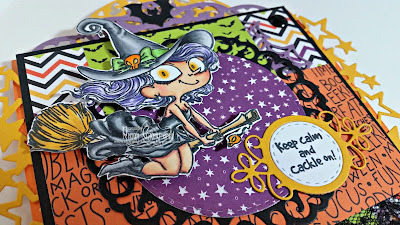 Today I am super excited to be taking part in the Kraftin' Kimmie Stamps New Release sneak peek for a SPOOKTACULAR new stamp from artist Annie Rodrigue! You may remember a short while back that Kim offered an exclusive Super Secret Krafty Klub Halloween Kard Kit... Well, THIS is the stamp that was included along with oodles of fab Halloween bits and bobs! Meet Grim Gretchen! Brace yourselves... 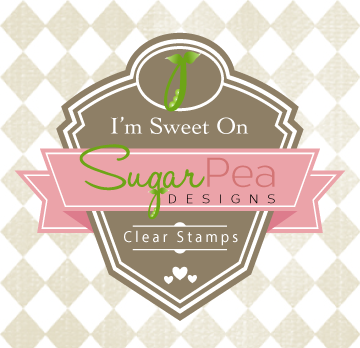 I decided to make a clean and simple card today! I stamped the image using Momento Tuxedo Black ink on a 5"x5" piece of Xpress It Blending card stock. I then colored the image with my Copics. 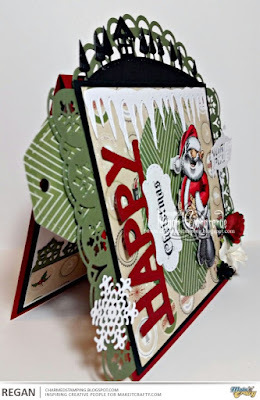 The sentiment was created using chipboard words from Make It Crafty! 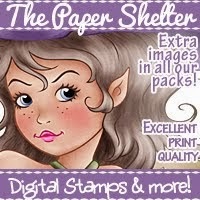 (If you haven't checked these out yet, you need to! They are my new obsession! 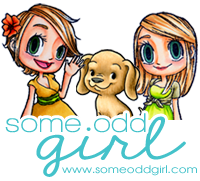 You can see the awesome selection in Zoe's shop HERE.) 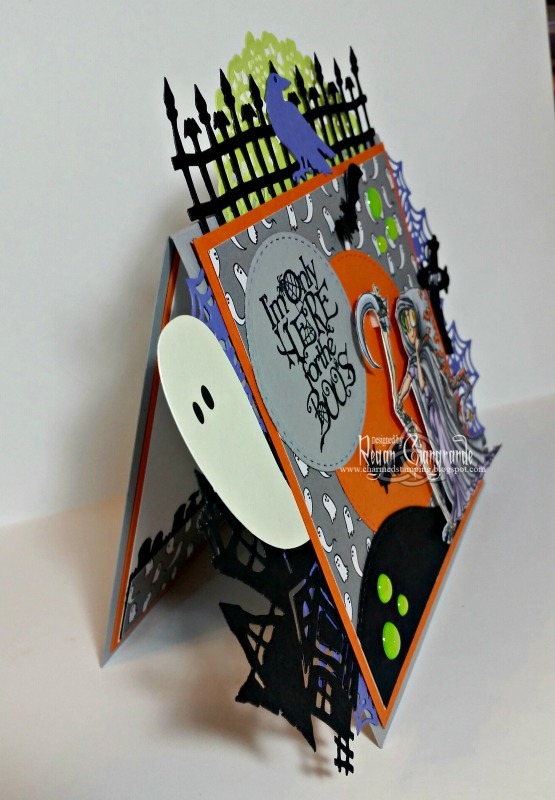 The corner spider web is a die from La-La Land Crafts. 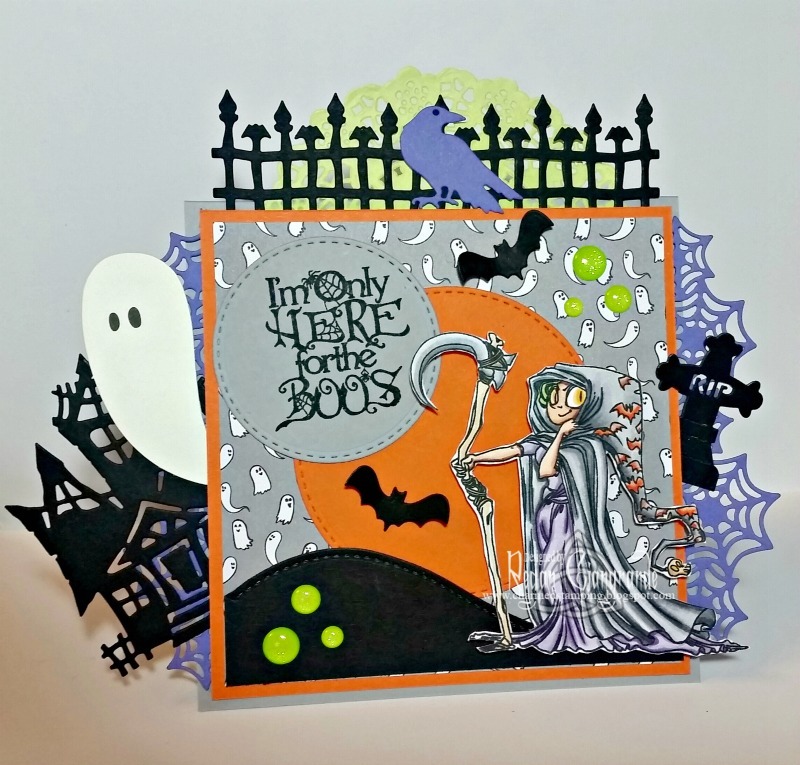 This ghoulish stamp set comes with one large main image and three fun sentiments!! 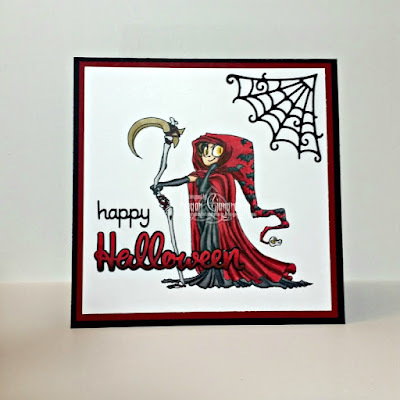 You'll get to see all the SCARY stamp sets as Kraftin' Kimmie shares them each day this week! Be sure to join in at the LIVE Online Release Party on Saturday afternoon at 2pm EST! 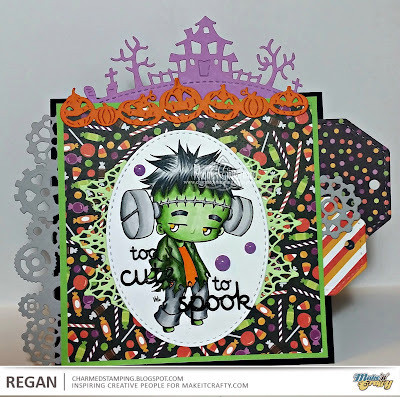 We'll be checking out ALL of the FOUR new clear stamp sets, sharing fabulous creations, giving away prizes and having tons of krafty fun! All of the Krafty Krew design team members and Special Krafty Guests (that's me!) 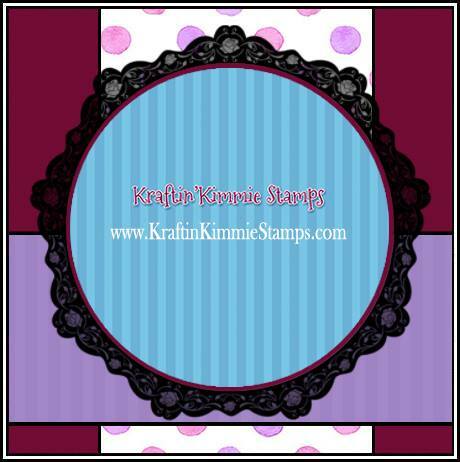 listed below have lots of sweet designs to share with you today featuring the GRIM GRETCHEN stamp set! Be sure to hop around and leave lots of love at each and every stop because one lucky commenter will WIN a gift voucher to the krafty shop! 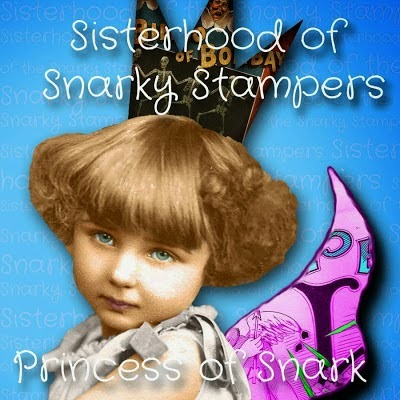 Plus we're doing a GIVEAWAY of the ENTIRE release on the Krafty Friends Facebook page! The winners will be announced at the party so don't miss it! Hello! 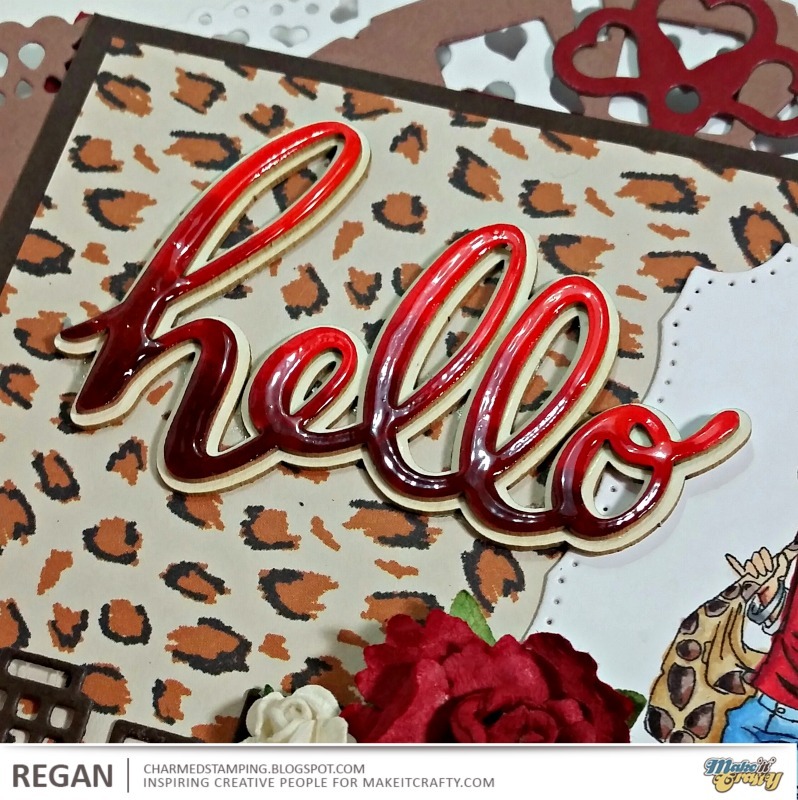 I'm here with this week's Make It Crafty guest designer project! 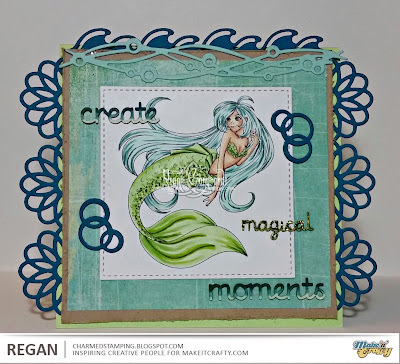 Today I am sharing a creation I made featuring Maddy Shopping as well as one of the AWESOME chipboard single layered words. 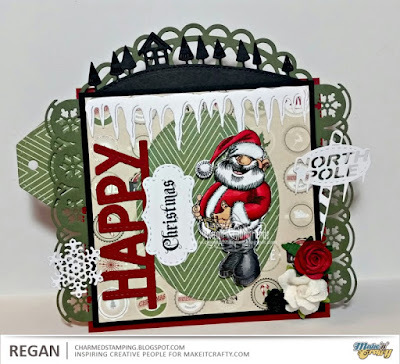 I have never worked with chipboard before but after watching Zoe's Facebook Live video last month I placed a fair sized ordered and decided to give it a go! The verdict: I'm obsessed and addicted! I colored Maddy with my Copics and cut her out using a die from Resplendent Rectangles Nestabilities (Spellbinders). 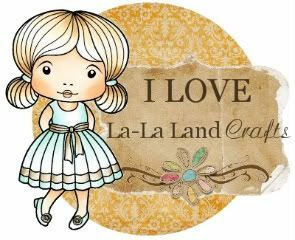 I added more dies from La-La Land Crafts (in case you haven't figured this out about me- dies are another thing with which I'm obsessed and addicted)! Here I've used Scallop Border, Heart Fan, Heart Doily Border, Heart Key, Skyline Border, and Bracket and Arrows. 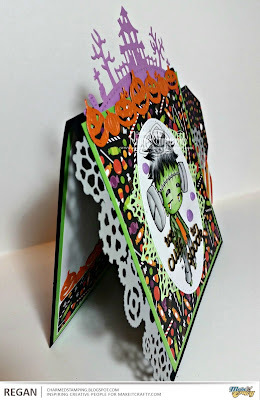 The Picture Wheel die is a Tim Holtz Bigz (Sizzix). Although Maddy has been on my wish list for a while and I was thrilled to finally color her up, I have to admit that my favorite part was the chipboard! I colored it in ombre reds, again using my Copics, and then applied a layer of Glossy Accents. The fabulous part about this chipboard is its versatility! 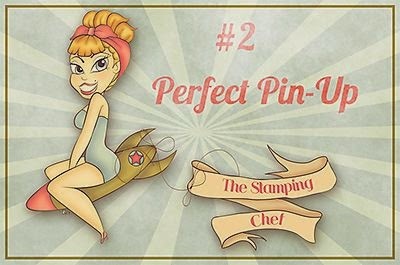 You can ink it, color it, use glitter, add gloss... So many possibilities! 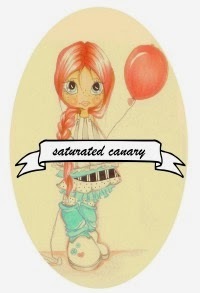 The words are often available in multiple sizes and offer so many possible combinations! 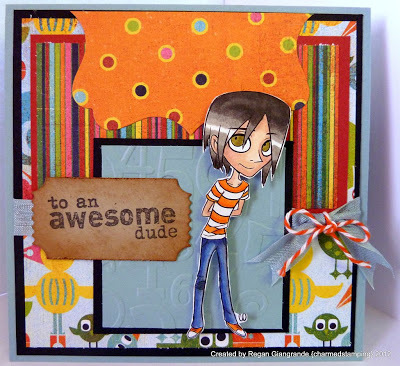 You can pair them with other chipboard words or use them with stamps to create the perfect sentiment! This project was so much fun! Shopping and crafting are two of my favorite things! Lol Thanks for having a look! Have an amazing day! This is Jolly Santa and he is colored with Copics and fussy cut. He was just too fun to resist! As usual, I've added layers with my dies. 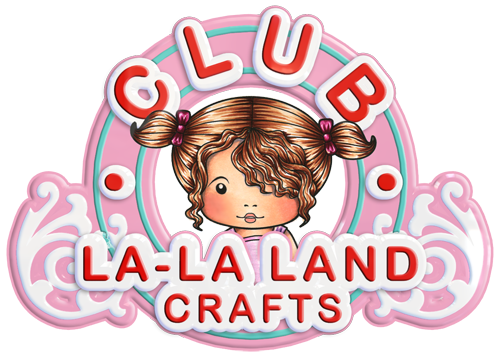 All are from La-La Land Crafts. 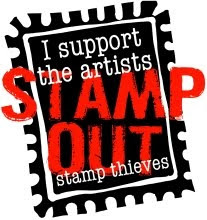 The sentiment is from the now closed Waltzingmouse Stamps. 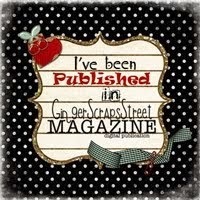 Thanks for taking the time to visit the blog and check out my project!